We are often asked — how does Ictect do Intelligent Content? What is unique about it? Here is what’s unique about how we do Intelligent Content at Ictect. Yes, Intelligent Content with Microsoft Word. 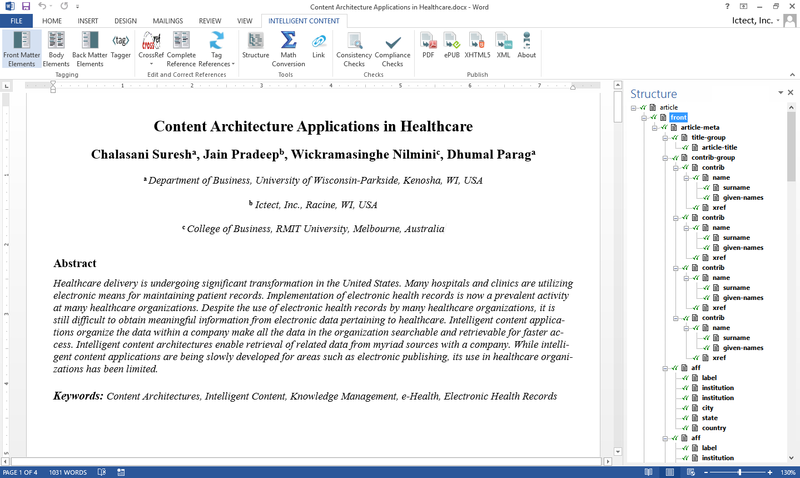 We embed a tab in the Microsoft Word ribbon called “Intelligent Content”. Here, intelligence (structure and semantics) is added to the content as the user interacts with it. We also focus on bringing the benefits of this addition to the user. For example, users can check the integrity of the document, automate formatting, and other tasks in the document. The more complex the document structure, the better tagging is with our software. Tagging documents manually is very time consuming, and conversion systems fail if the incoming document is not structured according to guidelines. However, Ictect software has a lot of resilience built-in. It handles complex tagging automatically. And, it is done by defining patterns — almost no programming required. When it comes to XML schemas, we support them all. We have already plugged-in DoD schemas, DITA, JATS, Docbook, QTI and many others. Adding a new schema is really pretty simple for us. When it’s a situation where there is no available XML schema (for example, marketing content), we create a new one. XML authoring tools sometimes bring disconnects between the real authors and the XML authors. The real authors like to write in Word. XML authoring tools require using PDFs for collaboration — leading to lots of copy/paste and errors. With our software, everyone can use Microsoft Word without having to worry about XML! We look at the content lifecycle and identify costs — outsourcing, conversion, time cost, etc. and apply our software to reduce those costs. We also make it easy to create multiple products, and slice content in many ways.